Last year I was traveling in Nashville, TN and went to an amazing vegetarian restaurant called The Wild Cow. I ordered the memorable Beans & Greens (Buffalo-Style) dish and was inspired to re-create it, sans tofu, for tonight’s dinner. Soak the dried red quinoa in a bowl of water for at least 30 minutes to help get rid of some of the bitter flavor in the coating of the quinoa. While the quinoa is soaking, start prepping your greens. Wash the greens well, then cut into 1/2 to 1 inch thick slivers. Put the olive oil in a large pan and heat. Put the chopped onion in the pan and saute until translucent. Add the chopped collards or kale to the pan, with 1/4 cup of water (or as needed) to help cook the greens and mix with the onions. Cook until the greens are wilted and bright green. Towards the end of cooking, add the garlic, vinegar, and cayenne pepper and stir to mix. While the greens are cooking, drain the quinoa and rinse. Put the quinoa in a pot with 2 cups of water and 1 bouillon cube and cook until boiling. Reduce heat, cover, and cook for at least 20 minutes or until the water is absorbed. After starting the quinoa, put beans from both cans into a pot (do not drain as the liquid is needed to help the beans cook). Add cajun seasoning and heat the beans for at least 15 minutes or more, covered, mixing occasionally. When the greens, beans, and quinoa are finished cooking, prepare to plate them. 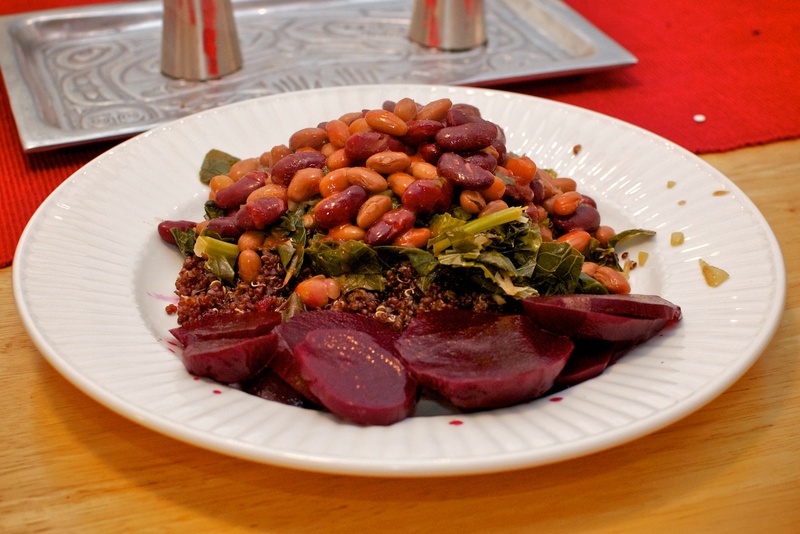 Put the quinoa in a large bowl or on a plate, then the greens, topped with the beans. Pour hot sauce over the beans to taste. Top with a dollop of vegan sour cream, if desired. I also included a side of pickled beets with tonight’s dish. I love the savory flavors of the greens, nuttiness of the red quinoa, hearty taste of the beans, and spiciness of the cajun seasonings in this dish.